This is a female Tamarixia radiata, highly magnified. 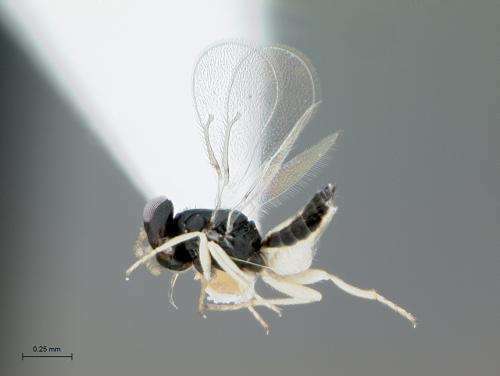 The tiny parasitic wasp lays eggs in Asian citrus psyllid nymphs, eventually killing them. Credit: Mike Lewis, CISR, UC Riverside. The Asian citrus psyllid (ACP) can spread the lethal and incurable citrus disease known as huanglongbing (HLB) or citrus greening that threatens the multi-billion dollar global citrus industry. In Southern California, large and widespread populations of ACP have been detected in several counties, having arrived, most likely, from Mexico where ACP is widely established. In 2011, for the first time entomologists at the University of California, Riverside released Tamarixia radiata, a wasp that is the natural enemy of the ACP, in a citrus grove in Riverside to help control the psyllid. But is this wasp safe to use? Does its introduction pose any risk to the environment? Results from Federally mandated tests performed at the University of California, Riverside now show that Tamarixia radiata is indeed safe for the environment and poses no undue risk to other insects, humans or pets. "Our work demonstrates that Tamarixia radiata is very specific to the target it is being released to kill—the nymphs of the Asian citrus psyllid in this case," said Mark Hoddle, the director of the Center for Invasive Species Research, whose lab performed the tests. Study results appear in the February 2014 issue of the Journal of Economic Entomology. Safety testing in biological control is important as the release of natural enemies may pose some type of environmental risk. In this instance, Tamarixia radiata were imported from the Punjab region of Pakistan, and tested for safety in quarantine at UCR over an 18 month period. This photo shows an Asian citrus psyllid nymph. Credit: Mike Lewis, CISR, UC Riverside. The study is the first published study designed specifically to determine the host range of Tamarixia radiata. The results are important as the wasp is being used for ACP biological control in Florida, Texas, the Caribbean, Central and South America, and Mexico. "These types of studies continue to advance the safety of biological control for suppressing populations of invasive pests thereby greatly reducing reliance on pesticides for control," said Hoddle, a biological control specialist in the Department of Entomology. "In urban areas, initially pesticide treatments were applied to ACP-infested trees, and chemically-treated buffer zones were established around sites to control the pest." To test the safety of Tamarixia, different species of native California psyllids were exposed to the wasp in a series of tests. The tests were designed to give the wasp a "choice" between ACP and a non-target psyllid speices, or there was "no choice" (that is, the wasp was only given access to a non-target species, one it had not evolved with). When given a choice, Tamarixia overwhelming attacked ACP, the researchers found. "In only one instance was a non-target species attacked at very low rates—less than 5 percent," Hoddle said. 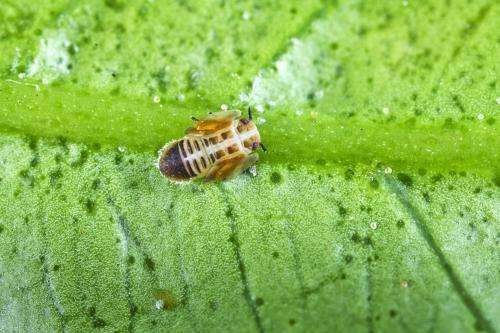 "This was the native pest potato psyllid, which spreads a bacterium that causes zebra chip disease. Such low attack rates are unlikely to cause population declines of this pest." According to Hoddle, such results demonstrate that carefully selected natural enemies used in biological control programs for invasive pests can be very safe and should not cause unwanted environmental damage. "There is growing concern over the damage that invasive species cause," he said, "and biological control programs don't want to be causing additional problems through releasing inappropriate agents for the control of invasive pests. Safety tests like those conducted in this study greatly minimize these risks." Hoddle noted that the tests were difficult to conduct in quarantine. "Native psyllids are hard to find and the native plants they grow on are difficult to culture in the laboratory," he said. "It was very rewarding to have completed these demanding studies over an 18 month period and to discover that the Pakistani wasp will be a good natural enemy to use in California for the biological control of ACP." In 2011, the U.S. Department of Agriculture reviewed and approved the 60-page Environment Assessment Report, the foundational work that the research paper is based on, and approved release of Tamarixia from quarantine. The data presented in the report is essentially the same as the published paper except that this time it was reviewed by additional scientists. "We have now released more than 200,000 Tamarixia radiata in Southern California at more than 350 different sites, mainly in urban areas and spanning six counties—Imperial, Los Angeles, Orange, Riverside, San Bernardino, and San Diego," Hoddle said. "They have established and are spreading, tracking down ACP on citrus in people's gardens and orchards." The Tamarixia larvae will eat the ACP nymphs, killing them, and emerge as adults about 12 days later. Adult female Tamarixia also eat other ACP nymphs, killing many in the process.